Howard Polin was born on April 15, 1924, in Philadelphia, Pennsylvania. He enlisted in the U.S. Army Reserve on December 7, 1942, and then attended the Army ROTC Program at Drexel Institute of Technology in Philadelphia for two semesters before his reserve unit was called to active duty. After completing basic training at Miami Beach, Florida, Polin attended meteorology school at Chanute Field, Illinois, and then went on to Jefferson Barracks, Missouri, for overseas training. He deployed to England on a troop ship in April 1944, and then was sent to Bodney Aerodrome as part of the 18th Weather Squadron attached to the 352nd Fighter Group, where he served until the end of the war in Europe. 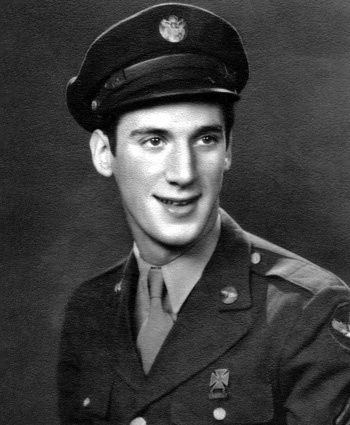 CPL Polin transferred to Bron Airdrome in Lyon, France, followed by occupation duty in Munich, Germany, and then service at Herbert Tareyton in Le Havre, France, until returning to the U.S. by ship in January 1946. He received an honorable discharge from the U.S. Army Air Forces on February 4, 1946, and later completed his Bachelor's degree in Mechanical Engineering at Drexel in 1949. Howard married Diana on New Years Day 1950 and they had three children together. They moved to Huntsville, Alabama, in 1959 when Thiokol Chemical Corporation moved him there to work as an aerospace engineer in the development of solid propellant rocket motors. Howard and Diana spend their retirement years seeing the world.